This three-part historical drama is set in Britain during and after WW2 (in the ‘50s & ’60s). When her husband dies, in the early sixties, Alison Wilson is already distraught. They lived comfortably in their little cottage. She’s a typist and Alexander is a spy novelists (and retired MI6 officer). They have two sons, Gordon and Nigel, and they were happy. However, as she tries to come around organizing her husband funerals, she receives the visit of a woman, Mrs Gladys Wilson, who claim to be Alec’s widow! Her happy world quickly crumbles as she struggles with one question: was her husband really the man he claimed to be? Was it just a lie? She knew Alex/Alec was a spy because they met at the Secret Intelligence Service headquarters where they were both working during the war. She starts her own investigation, questioning Alex’s handler at MI6, some colleagues in the Intelligence Service, Gladys’ son. She becomes obsessed with this quest to discover who the man she thought she knew for twenty-two years really was. The deeper she digs in his past the more secrets she discovers! Through flashbacks, she relives their history together until she understands who he really was. When she comes to term with the truth, she becomes a nun, but she never could tell her sons about their father until after she died—she had written everything down. It is a beautiful and compelling story told in the manner of a spy or mystery novel. The most interesting part is that it is a true story — and the cool twist is that Alison Wilson is played by actress Ruth Wilson, he own grand-daughter! Alexander ‘Alec’ Wilson wrote twenty-four novels, mostly inspired by his career in the secret service and his huge imagination. He was a bigamist who had seven children with several wives. Many aspects of his life are still a mystery as, even today, the Foreign Office still consider his files as ‘sensitive’. 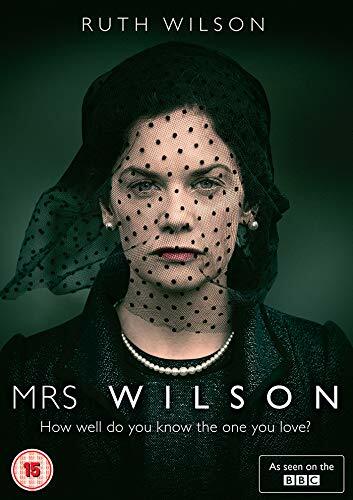 Mrs Wilson is a very interesting historical drama, beautifully filmed and cleverly told. I enjoyed it greatly and recommend it warmly. It was well received by the critics (with rating of 88% on Rotten Tomatoes and 7.4 on IMDb). It aired on BBC One in late November / early December and will premieres on PBS Masterpiece Sunday, March 31, 2019, 9/8c (and will subsequently be available on Dvd, iTunes Store and Prime Video). Don’t miss it!